Blast Match Fire Starter: Our revolutionary one-handed, all-weather, fire starter generates intensely hot sparks three times hotter than a standard match. Blast Match is safe, easy-to-use, and works in any weather. Wet Fire Tinder: Our amazing fire starting tinder is non-toxic, odorless, smokeless, and can start a fire even in the driving rain. In fact, Wet Fire tinder burns longer when wet. A small pile of tinder shavings is all you need to start a roaring fire. Star Flash Signal Mirror: Our signal mirror is unbreakable, can be aimed precisely, floats and can signal for communications up to 100 miles away. It can be used around camp to apply first aid or camouflage. Star Flash is the standard issue signal mirror of the U.S. Air Force and other government agencies. Jet Scream Whistle: Our whistle is one of the loudest in the world. Jet Scream's ear-piercing shriek can be heard above most natural or man-made noise. 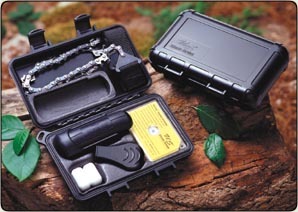 Use Jet Scream in the city or woods for communication and personal protection. Saber Cut Saw (in Deluxe only): Our flexible hand chainsaw is compact, razor sharp, bi-directional, and self-cleaning. It can be used for cutting from a variety of angles and places where you have little clearance. It i specially treated to retard ruse and corrosion. Hard Cache Carrying Case: Not only is the Hard Cache watertight, it is virtually indestructible. Toss it around, sit on it, or step on it! You'll have a tough time damaging it. Keep it in your backpack, your glove compartment, your boat, or even your pocket! Case size: 6-1/2" x 3-78" x 1-5/8".